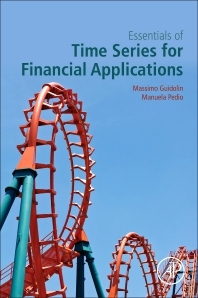 Essentials of Time Series for Financial Applications serves as an agile reference for upper level students and practitioners who desire a formal, easy-to-follow introduction to the most important time series methods applied in financial applications (pricing, asset management, quant strategies, and risk management). Real-life data and examples developed with EViews illustrate the links between the formal apparatus and the applications. The examples either directly exploit the tools that EViews makes available or use programs that by employing EViews implement specific topics or techniques. The book balances a formal framework with as few proofs as possible against many examples that support its central ideas. Boxes are used throughout to remind readers of technical aspects and definitions and to present examples in a compact fashion, with full details (workout files) available in an on-line appendix. The more advanced chapters provide discussion sections that refer to more advanced textbooks or detailed proofs. 2. Autoregressive-Moving Average (ARMA) Models and their Practical Applications. Massimo Guidolin is a full professor in the Department of Finance at Bocconi University. He earned a Ph.D. from University of California, San Diego in 2000. He has worked at the University of Virginia as an assistant professor in financial economics, the Federal Reserve Bank of St. Louis at first as a senior economist and then as an Assistant Vice-President (Financial Markets), and the Accounting and Finance department of Manchester Business School as a chaired full professor in Finance. His teaching has spanned corporate finance, asset pricing theory, empirical finance, derivative pricing, and of course, econometrics both the undergraduate and graduate (MSc. and doctoral) levels. He has published in top economics, econometrics, and finance outlets such as the American Economic Review, Journal of Financial Economics, Journal of Econometrics, Review of Financial Studies, and Economic Journal. He serves on the editorial board of a number of journals, among them Journal of Economic Dynamics and Control, International Journal of Forecasting , and Journal of Banking and Finance. Manuela Pedio is adjunct researcher associated with Bocconi’s Finance specialties and has experience as an analyst in derivatives sales and trading. She teaches courses in portfolio management and introductory statistics at Bocconi. Her research interests mainly concerns the role of regimes and statistical instability in asset pricing and portfolio choice. She has published articles and books on these topics with prime editorial companies in Europe.